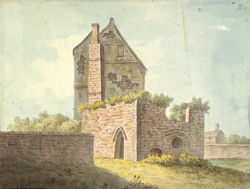 View of the ruins of part of Beaumont Palace, originally built in 1132 as a hunting lodge by Henry I. Richard I and his brother John were born here. The Carmelite order arrived in Oxford in 1256 and in 1316 were granted a site in the grounds by the King. In 1828, Beaumont Street was laid out on the site of the former palace.